One for the Season; The Best Christmas Themed Games for the Holidays! Hey it’s Christmas Day! A time of goodwill. Of family. Of giving and receiving presents supposedly brought to you by a fat guy in a red suit with a white beard. In other words, not a time for reading articles on gaming websites. But hey, you’re here now. 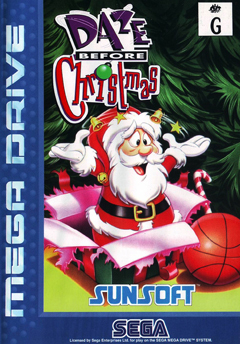 And based on that title, I’m gonna assume you want some suggestions for Christmas themed games to play. Something that really gets into the spirit of the holiday season, right? Do not buy any Christmas games on the Wii or Wii U. With maybe one or two exceptions, they’re gonna be crap. Something like Rudolph the Red Nosed Reindeer isn’t worth the cost of the disc it was printed onto. Nor is that Christmas themed ‘find the hidden objects’ game that’s likely going around the eShop by now. Santa Claus Jr and Santa Claus Saves the Earth are pretty crap too. Instead, here are some real suggestions for enjoyable games to play on Christmas Day. Starting with the inevitable Christmas themed platformers. Such as Daze Before Christmas on the SNES and Mega Drive. Yeah, you knew this was coming. After all, a game where you actually play as Father Christmas and then collect/deliver presents while defeating the various evil bosses out to stop your journey? That’s about as obvious a Christmas themed game as you can get. And it’s quite good too. Not amazing, but decent, with some nice graphics and music to get you in a festive mood. Also on the same systems, you’ve got James Pond II: Codename Robocod. Starring a secret agent fish who’s very clearly a pastiche of James Bond, he has to stop the evil Dr Maybe, who has taken over Santa Claus’ workshop and attempted to ruin Christmas in the process. Again, it’s a 16 bit platformer, albeit one a hell of a lot more competently designed than Daze Before Christmas was, with an interesting mechanic where Pond can stretch his body upwards to view or reach new areas. And hey, he can fly a plane around too! Another notable one to try is Santa Claus in Trouble, a neat 3D platformer that has Santa Claus collecting presents in a weird Croc like world. Interesting, it’s part of a series of 2 games, with the first being entirely free to download and the second being a paid, much higher budget follow up to it. Both games are solidly designed with decently done game mechanics and lovely graphics, and they work about as you’d expect them to. As well as the old Grinch video game based on the movie. Yeah, that movie. The home console one is a mediocre platformer/action adventure thing, but the Game Boy Color one is actually a really good stealth game in the style of the old Metal Gear titles! To the point IGN gave it a 9/10 review score! But what if you want something a tad more familiar? Like, an expansion of an existing game? Well you’re in luck here too. Because quite a few great old school games have Christmas levels and episodes too! Which were then redone and rereleased as Jazz Jackrabbit 2: Christmas Chronicles. 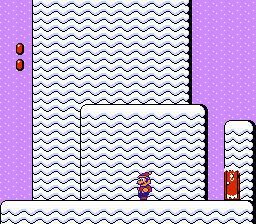 Either way, all the levels are very nice, very festive affairs filled with Christmas trees, twee looking houses covered in snow and lights and a whole multitude of snowmen. Saints Row IV: How the Saints Saved Christmas. Where your gang has to fight to save Santa from an evil alien warlord called Clawz. Christmas Lemmings, which is exactly what you’d expect it to be. The Christmas mission in Hitman. Where you have to kill the robbers from Home Alone (and maybe get a Santa outfit in the process). Plus a Christmas themed level for Viscera Cleanup Detail, where you have to clean Santa’s Workshop after ‘jolly’ old Saint Nick when on a homicidal rampage. And a Christmas themed version of The Escapists called The Escapists – Santa’s Sweatshop. That one has you playing as an elf who has to escape the workshop after suffering through Santa’ cruel regime for the last 20 years of his life. And both make for very different takes on the whole ‘holiday season’ affair. Which brings us to the final set of games. Namely, the fan games and mods. 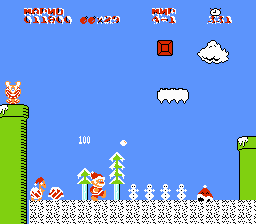 Did you ever want a Christmas version of Super Mario World? Well, no problem! There are tons and tons of these online. For Super Mario World hacks alone you’ve got the likes of SMW Christmas Special, A Haunted Christmas and Mario’s Christmas Adventure among many others. 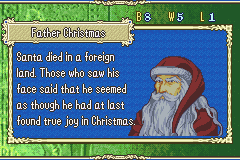 Other possibilities here include Holiday Hex, a really interesting Earthbound mod that has two Christmas loving kids team up to save it from evil, Pokemon Christmas (which is basically Pokemon Gold and Silver Christmas edition) and the Christmas themed chapter of Fire Emblem 7 Chaos Edition. 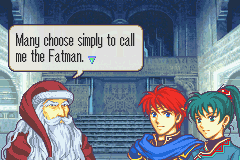 Yeah, Santa in Fire Emblem. It’s not amazing (at least, compared to the main storyline), but it does a competent enough job of providing some fun Mario platforming on Christmas Day. Short too, in case your only allowed playtime is between Christmas dinner and your favourite TV show starting. So yeah, I hope that gives you some ideas of what to play this Christmas Day. Just avoid the shovelware, okay? Merry Christmas! Five Good Christmas Songs from Nintendo Games!